Learning science is about to get a whole lot cooler for hundreds of high school students in Kenya. An international project co-led by an NYU Abu Dhabi chemist will deliver digital education materials such as interactive modules, online simulations, and even virtual chemistry experiments to many classrooms. 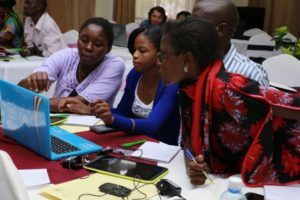 The idea for the project — Chemistry on Computers in Kenya — was born at the second Joint Undertaking for an Africa Materials Institute (JUAMI) conference held in Arusha, Tanzania. Kenya’s government is already providing scores of tablets to elementary school students and funding more computer labs in secondary schools, Rodenbough said, but they need help establishing a digital curriculum. They have computers but nothing to put on them for students to learn. CCK aims to develop at least three computer-based chemistry lesson plans this year and then encourage science educators to distribute them across their own personal networks. The project has the potential for a very large impact because “it’s easy for teachers to share digital materials” even beyond Kenya, Rodenbough added. Along with Rodenbough, the project is co-led by PhD student and Kenyan chemistry teacher Agatha Wagutu at the Nelson Mandela African Institution of Science and Technology in Tanzania. The JUAMI conference was funded by the US National Science Foundation and the CCK project received funding and support from the Materials Research Society Foundation. Andy Gregory, NYUAD Public Affairs; this post originally appeared here. This entry was posted in Abu Dhabi, Faculty. Bookmark the permalink.